Tori wey BBC don confam be say President of Nigeria Senate, Bukola Saraki dey inside di senate chamber for National Assembly Abuja, to do im work. 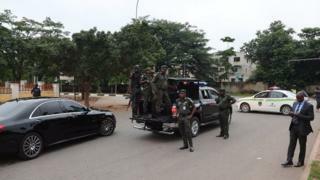 Security agencies bin block road to im house and dat of im deputy Ike Ekweremadu for di capital Abuja. BBC no fit confam if na true-true say di security pipo wey di for dia vans, dey really block di road so dat im no go fit comot for house. Dii police men later waka comot for di area, but Saraki special adviser for foreign affairs and international relations, Bamikole Omishore bin tell BBC say, "dem no fit locate di senate president." Senator Saraki, bin don enta twitter say di invite wey Nigeria Police invite am to come dia office on Tuesday, na to stop plan by some members of di Senate and House of Representatives to go anoda party. Saraki bin post plenti tweets about di police invitation. Im say police plan na to hold am on Tuesday and Wednesday so dat di "so-called" defection plan no go work. Oga patapata of police, Ibrahim Idris bin ask Saraki to show face for dia office on Tuesday by 8am, to come give dem more explanation wey concern di Offa robbery wia e pass 30 pipo wey die. Those behind this fresh assault will fail as I have nothing to do with the robbery incident or any criminal matter for that matter. Im accuse police say dem don corrupt dia investigations into di Offa robbery incident and say dem don turn into wetin di party wey dey for power dey use to press dia opponents down. "Dem dey blackmail pipo wey dem no want make dem use dia free mind choose which platform dem wan pursue dia ambition and dem dey harass those wey dem sabi say if dem leave APC e go affect dem for di elections wey dey come," im tok. Police bin arrest 27 pipo and five gang leaders wey dem say get hand for di Offa robbery wey happun for 5 April dis year. Police bin write Saraki to explain how im take connect wit di five gang leaders and im bin reply dem. Dem say afta dem don take time read im letter well-well, di Inspector General discover say e get some more tins wey Saraki suppose come tell dem, plus say im bin complain say im no see di statements wey di robbery suspects make.